Storm in a tea-cup, then. The quoted bit of puff . . . offers exactly what I do not want from a specialist magazine - unless the "behind the scenes snippets" are to be technical. Racing cars are highly technical objects and we engineers (and some non-engineers I think) might be interested in what's done and why, but I do not expect any of that. Today Editor Joe Dunn seems to think that by sending that puff out again as an e-mail we will be impressed. If he reads this, I can say to him that I am not. I'm liking it, think Joe Dunn has got the ship turning in the right direction, much better font, impactful use of images, like that Jennie Gow is in and some others have gone (Meaden), and bringing Lunch futher forward. The Brabham story was a good one to. My sub has just finished and I'd given up with the previous version but might just hang around to see whats in next month, hopefully no more Hamilton. I have the opposite impression. To me the changes seem to be a net negative. I have long since allowed my subscription to lapse and just cherry pick the issues that interest me as they come out. With a heavy heart i'm going to do the same. I've found there's less and less content to read that interests me and I know it sounds daft but losing Simon Arrons endearing diary of events he's attended is the final straw. This could have been written by me! I gave Joe Dunn very detailed information why my heart is no longer in it but there was not even an answer, talk about feedback. But each and every day I receive at least one mail promoting merchandising articles and subscription offers. You're right, things have changed. A few years ago, I was mildly annoyed when Motor Sport printed a two page article, where one of the pages was all white type over a full page b/w photo, the technical term is "reversed out". My eyesight is good, I didn't need reading glasses at the time, but although I could probably have struggled through it if I'd been more determined, I didn't bother and fired off an e-mail to the then Editor Damien Smith. I was perfectly polite so as not to risk upsetting anyone, but didn't really expect anything more than an acknowledgement, if even that, I just wanted to make what I thought was a reasonable point. I was pleased and surprised to receive a speedy, lengthy and pleasantly worded response from Damien himself, explaining the process of transferring content to printed page, which as an ex-printer myself, though many years before, I sympathised with, it often isn't possible to check legibility until you see the actual result on the printed page, by which time, it's usually too late to do anything about it. I'd made the point that for a magazine with a probably relatively elderly readership, it wasn't a good idea to include pages, or even photo captions, that a significant number of their readership would struggle with. Damien agreed, and admitted that this article had indeed been a mistake that shouldn't have happened. He endeared himself further by telling me that "We have a 50 year old on our staff, so we're well aware of legibility problems that would be unfair to our readers with possibly less than perfect vision. Bless him. I have one serious complaint about the new format. Where the devil have they hidden the publication date of the next issue? It used to at the foot of the editor's piece, but no more. That's it! Enough is enough. I'm not swanning round W H Smiths every day for the next week in the hope that the next issue appears. I have less important things to attend to. 6 March .And - a wild guess- 6 April too . I am sure that you are right. But how did you know?? Like Dan, I was given a free copy of the magazine at Race Retro. I found very little to hold my interest, which is unusual for this magazine, but that doesn't mean it's rubbish. I think the magazine has taken the decision to evolve but the only problem with this is it doesn't appear to know who it's evolving to - who is its target audience? If the Jennie Gow article or the triumphalism of taking a picture of a helmet or the dedication to Lewis Hamilton or the musing of Mark Hughes about Ferrari, it appears it wants to be a of more discerning kind of F1 Racing for the fans of current F1 with a bit more luxury money; hence more features on cars. 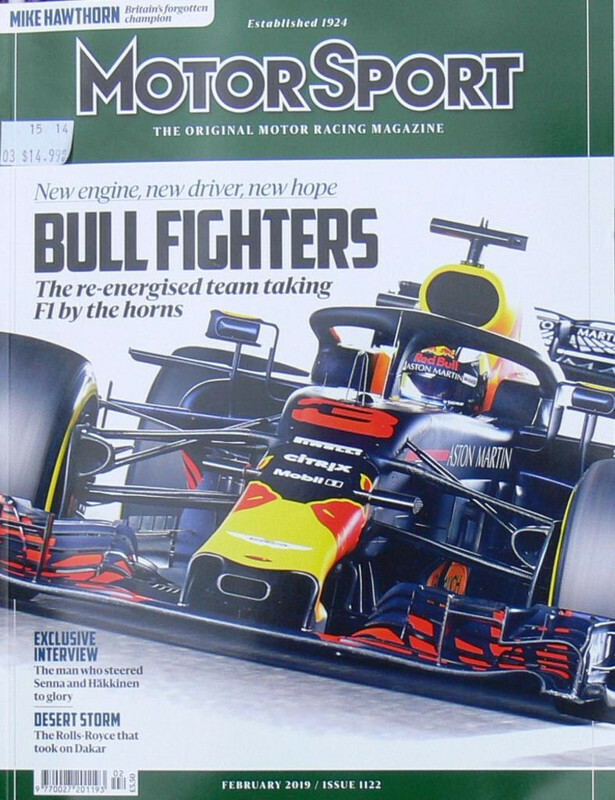 I think that Automobilsport and other magazines cover history so well now that MotorSport has realised it's been left behind and has chosen a different tack. If that tack is what keeps it alive, fair play to it. But for me, and so many others, if it is geared towards the here and now, then it's a shame to alienate so many of its readership in one fell swoop. What was so awful about the Hamilton stuff ? BRG - because the website says so somewhere. Hamilton material belonged firmly in that well known fanzine , F1 magazine , and not Motor Sport. Mark Hughes undoubtedly knows his stuff (even if he can wear his learning heavily at times ) but the hagiographic tone of the piece jarred. It was starry eyed stuff , and whilst we know Lewis is a brilliant driver he's not the Messiah . And if he is , what does that make Nico Rosberg? Edited by john aston, 03 March 2019 - 07:44. ...whilst we know Lewis is a brilliant driver he's not the Messiah . And if he is , what does that make Nico Rosberg? Exactly how I feel too, I also picked up a free copy at Stoneleigh to test the water again after cancelling my subscription which had run for 25 years last year. I will not renew my subscription again though, will stick with Automobilsport and only read carefully selected articles on the MS website, by Mark Hughes, Mat Oxley etc. Some of the podcast were good but were very often flawed by forcing in stupid questions either by the interviewer himself or "reader's questions"
"When was the last time you wielded a spanner and what was it for?" I am not sure why you would think the helmet stuff was risible. It would no doubt mean a lot to Hamilton, being the helmet he wore to he win his fifth championship. It would also be irreplaceable, and and of course extremely valuable. And I thought Hughes did a pretty good job explaining why Hamilton is more than a little bit different, you know, being a mixed race black guy in a what is an overwhelmingly white mans sport. Me neither. Who raced it? I thought Lepp won the series in the Ultramar March. I could be very wrong, but was this the championship that was bolstered by Clubmans cars? Edited by Myhinpaa, 04 March 2019 - 15:05. MCS is right - John Lepp won the 1976 RAC Sports Car Championship in his Ultramar March, ahead of Iain McLaren in the ‘Chocolate Drop’ Chevron. Lepp won three rounds of the 6-race series to McLaren’s two. The numbers were indeed boosted by the addition of a Class B for Clubmans cars. What a fabulous link! Some glorious pictures!! I'm with Thundersports & Parksie. Always looked forward to its arrival, but I shall be cancelling my subscription. I have little or no interest in F Wun these days, I am rarely interested in the road cars they choose to test, and Lunch With is a pale shadow of its former self, much like the magazine has become. I see many of the moans above have proved ill-founded. Plenty of Simon Arron, and Gordon Cruikshank still around, despite concerns that they were axed. And Lunch With A (Occasional) Autosport Forum member this month - that must be a first, surely? But still no date for the next issue unless I consult their website! Which matters not a bit to me. Being on the US side of the Atlantic, my issue always comes three to four weeks after publication. For example, the issue with Hamilton on the cover just arrived two days ago! Which matters not a bit to me. Some of us are still analogue - as in, go to shop, find copy of MS, pay cash, go home, read. Which is made more difficlut if you don't know when to go to the shop. I don't know many periodicals that don't eagerly tell you when the next issue comes out. Another fabulous lunch-with. I don't follow rallying - just don't have the cranial capacity to keep up with every branch of motor sport. Was disappointed when I saw lunch was with a rally navigator, then persuaded myself to read it - fascinating. It is rare that Motor Sport gets its boots dirty by covering rallying, but this was a fascinating conversation. I knew of Gallagher of course but had never really focussed on how many top drivers he had accompanied. An astonishing roll of honour of major rally drivers all kept on the straight and narrow by one lad from Belfast. And there was an interesting nugget about Tony Pond turning down a Toyota drive because they wouldn't build him a RHD car - a strange decision on his part. I thought it was unfortunate that Fred's important role as C of C for Rally GB was given no more than half a sentence. Surely deserves a bit more than that, but maybe they ran out of time. Elsewhere, these 'Archives' pieces are a bit disappointing. Maybe that's why the tapes were just put in a box and never used. The first one (JEnks/Senna) just seemed to be rambling, and the latest one with Ron Dennis seems to tell us little. Although I found his rude comments about Mansell didn't sit well with his comments that he wouldn't do an autobiography if it meant saying bad things about Senna - a tad hypocritical, that. As I life long reader, I do feel it's going down hill. Why have there been so many changes in staff and writers? I really liked Meaden who is an active racer and has his finger on the pulse. I see the online forum has gone, you used be to be able to debate things there with writers. It's getting a bit like our local country magazine, full or articles about the elite and adverts for things that very few can afford but they still expect the masses to buy it. They are by and large ignorant of the great mass of club motorsport that takes place. In the current issue there is a feature about home popular historic rallying is but purely via the eyes of HERO who run events for the very wealthy. The entry fees and costs they quote are eye watering! As a historic rally organiser I can say that most club rallies (effectively the same format as a HERO one) can have an entry fee of about £100 including all the food for the day. HERO are quoted as saying they have 240 drivers doing their 8 events last year which is actually not many and implies that a relatively small number of wealthy drivers were able to afford the time and money to do several events in a year. Now at club level, talking the clubs that run under the HRCR and NESCRO umbrellas, the number of drivers will be far higher. However NESCRO and HRCR don't take out full page adverts in MS! Like others I wrote to the editor saying what I liked or did not like and did not receive a reply. That implies my opinion as a long term subscriber does not matter. With all the staff and contributor changes we don't know who they are and what there credibility is. Jenny Gow's column looks as if it escaped from "Hello"! Did we not have some girl do something similar for a few issues some years back? Edited by Derwent Motorsport, 17 March 2019 - 11:50. ^ Monisha Kaltenborn must have a few tales to tell. Perhaps too soon after her departure from Sauber to tell the juicy bits, I fear. But I would second Shirley Muldowney wholeheartedly - she is too often overlooked. As are Dragster/Fuel racers anyway. I´d also have John Force - now that would make some good stories. Edited by Ralf Pickel, 20 March 2019 - 17:35. It's a fair point. There are quite a few possibles in addition to those already mentioned. Louise Aitken-Walker (Ladies WRC) + plus a few other top women rally drivers. Perhaps LordAston should e-mail the editor with the suggestions? Of the female Sportscar racers Desire Wilson who , as well as being the first female driver to win a Formula One race also won the Monza 1000 km and Silverstone 6 Hour races in 1980 sharing Alain de Cadanet's eponymously named car and 2004 Spa 24 Hour race winning driver Lilian Bryner would make interesting subjects . I'd agree about Shirley "Cha Cha" Muldowney, but Simon Taylor had lunch with John Force several years ago, and he didn't exactly set the pages alight, it was one of the dullest and least interesting ones ever. Simon just didn't seem to be able to get much out of him, and most of it consisted of him posing questions to John and effectively answering them himself, we didn't really learn a lot from it. With Simon's probing, John described the pounding his head got from violent contact with the roll bar on each strip launch, and it seemed to have affected his mental acuity. I have nothing at all against drag "racing", as you can see from my championing of Shirley, but there must be better potential lunch companions out there. Of course we'd prefer new stuff from good candidates, but MS could do worse than reprint a few of the earlier ones, when Simon was firing on all cylinders, I'm sure he'd appreciate the repeat fees. Actually I greatly enjoyed the Force piece - possibly because it was done at all. As a drag fan , I do get tight lipped when the sneering starts , as it often does. .
Could a UK member help answer this please. Somewhere I saw that the February 2019 issue had a photo of Mike Hawthorn on its cover. Is that correct? Why I ask is because I've just purchased Feb here in Oz (current surface mail edition) and it has the Hawthorn feature, but the horrid Red Bull thing on the cover. I didn’t buy it, so can’t confirm definitely. Thanks Tim. Between you and Roger L sending me the same cover image with Mike, it appears we Aussies got the rough end of the pineapple with the Red Bull cover. Edited by Rob Ryder, 28 March 2019 - 18:57. This is what we got for the Feb issue, Rob. Yes, definitely was the Hawthorn cover. I have it here. The next Issue date has reappeared! I noticed a 'howler' though, in the You Were There section on the 1965 Le Mans 24 Hours, where the Rover-BRM of Hill/Stewart is described as '2-litre turbocharged'. Well... the engine was charged by a turbine, wasn’t it... !